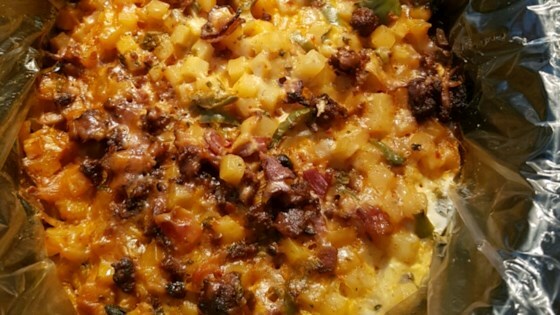 "Great recipe for our Thanksgiving brunch. It smelled so wonderful to wake up to. Next time I'll use a slow cooker liner to make clean up even easier." If you half the recipe, use 8 eggs. Start at 12:00am. Add fried egg on top of casserole per serving. If using chorizo, serve with sour cream and tortillas. Add extra cheese on top for every serving when serving. Also, if use bacon double it! Cooking time was great. This is easy to make. Just do not over bake. It's nice when you have guests and are playing hostess. I did not care for this.... texture was spongy and not particularly pleasant. Smell wasn't exactly anything I'd want to smell either. Flavor was pretty bland and watery. I having been making this for years. I found the ham was too watery. I prefer to use bacon or sausage, or my favorite, bacon and sausage. delish!